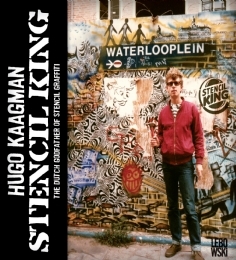 This post comes a little late – Hugo Kaagman‘s book Stencil King was published in November 2009 by Lebowski Publishers. I was honoured to be asked to write the introduction to it. I first got to know Kaagman’s work on an art college trip to Amsterdam in 1986 – I was blown away by what I saw – hundreds of amazing stencils making up a giant mural in Waterlooplein. I guess this is where I first got the bug for Stencil Graffiti. Many years later I was able to invite him to take part in one of the biggest ever stencil art gatherings – Cans Festival underneath Waterloo station. The book is well worth tracking down to see a life in stencils by the stencil kind himself….